A penalty marker at the 81st minute for midfielder Marcus Campanile was all the Cape Breton Capers needed on Thursday, as they bested the UQAM Citadins 1-0 in the third quarterfinal match of the 2018 U SPORTS Men’s Soccer Championship. Campanile was a key figure in Thomas Niendorf's Highlanders USL League 2 team this past summer. In addition to fellow Highlanders and Cape Breton Capers, Peter Schaale, Stuart Heath, Cory Bent and Charlie Waters. Schaale recently earned the Atlantic University Sport Most Valuable Player award. In the middle of a largely defensive battle, Campanile took advantage of one of the game’s few-and-far between scoring opportunities. After a handball was called on UQAM defender Hamza Methamem after a tussle with Caelann Budhoo, Campanile stepped to the spot and beat UQAM netminder Valentin Lamoulie. Goal! @gocapersgo take a 1-0 lead on @Citadins, scoring a penalty kick. Marcus Campanile (@gocapersgo) marque un but! Ten minutes in, Michael Chatel got one of the first quality chances of the contest, as the UQAM midfielder tracked down a ricocheted ball about 25 yards out from the Cape Breton goal. Letting it fly, Chatel’s curler was snared nicely by a diving Capers keeper, Ben Jackson. The middle portion of the opening half saw the two sides trade runs through the middle of the park, but neither could generate much in the way of threatening chances. As the game entered stoppage time in the first stanza, the Capers earned their best chance of the contest. After running down a long ball down the right flank, Cory Bent (Highlanders 2018) did well to cut back and find a wide-open Budhoo. The third-year midfielder had a clean look, but missed the net wide right, as the two sides went to halftime scoreless. 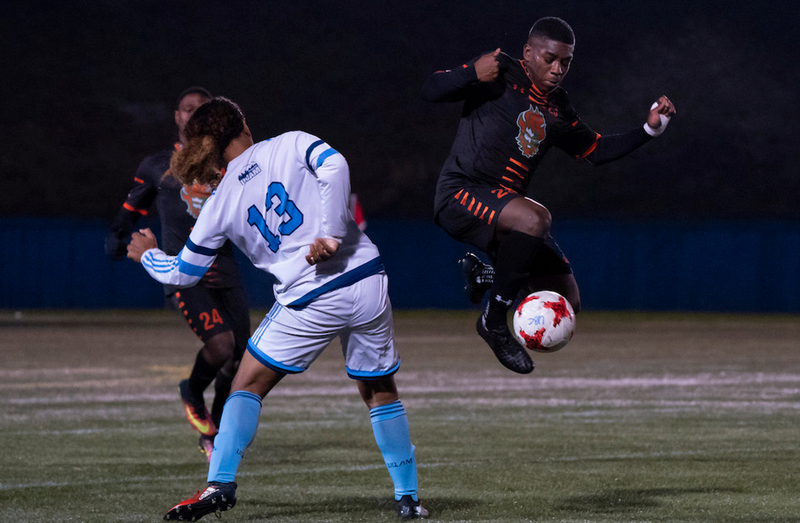 There was a momentarily threatening rush 20 minutes into the second half, as Bent stripped a rushing Citadins defender 20 yards out from the UQAM goal. The only thing that stood between the forward and an open run at goal was defender André Bona, who made a well-timed sliding tackle to divert the opportunity. Campanile’s goal seemed to spark the physicality levels on both sides, with the Citadins throwing everything at Cape Breton to try and equalize the game late in the second half. The best opportunity of the contest for UQAM came in the final minutes, as Bona made a wonderful run down the right flank, jumping on an open ball and testing Jackson from in tight. Closing out the win, Cape Breton will take on the Carleton Ravens in the Semi-Final #2 on Friday, November 9. Semi-Final #1 will see Trinity Western Spartans challenge Montreal Carabins for their place in the finals. Semi-Final #1 takes place at 4:00 PM PST, with the Semi-Final #2 taking place at 6:30 PM PST. All matches are taking place at Thunderbird Stadium in Vancouver, BC.